Thirteen new studies will address pain with non-drug approaches. The National Institutes of Health’s National Center for Complementary and Alternative Medicine (NCCAM) and National Institute on Drug Abuse (NIDA) and the U.S. Department of Veterans Affairs (VA) Health Services Research and Development Division provided funding for this initiative. The research projects are located at academic institutions and VA medical centers across the United States. A 2011 Institute of Medicine (IOM) report states that nearly 100 million American adults suffer from chronic pain at a cost of $635 billion per year and notes a need for a cultural transformation to change this problem. Chronic pain disproportionately affects those who have served or are serving in the military. 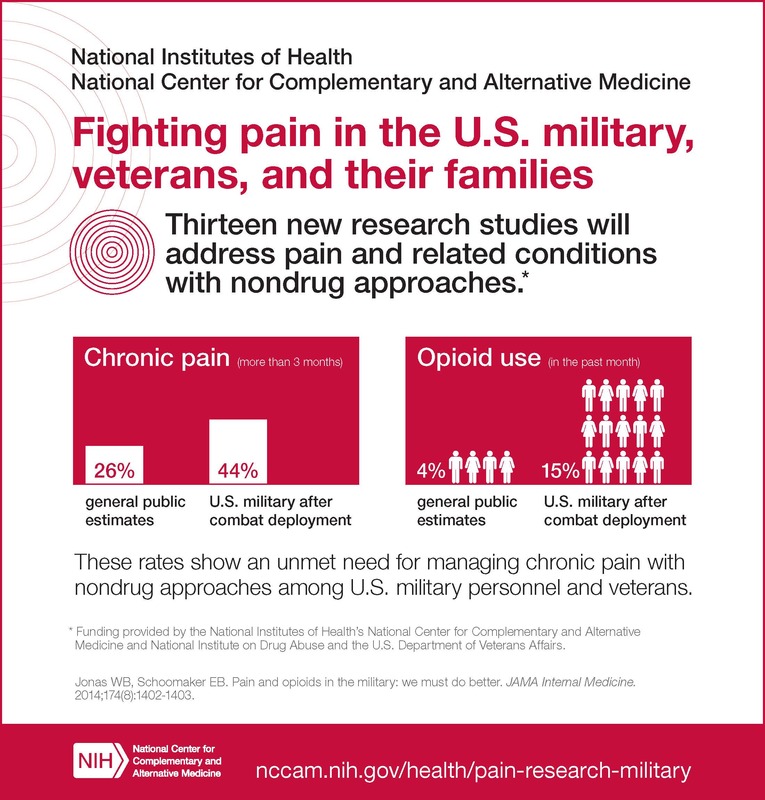 A June 2014 report in JAMA Internal Medicine showed an alarmingly high rate of chronic pain &mdash ;44 percent &mdash ;among members of the U.S. military after combat deployment, compared to 26 percent in the general public. One co-author of the commentary is Eric B. Schoomaker, M.D., Ph.D., a retired U.S. Army lieutenant general who is a scholar-in-residence and Distinguished Professor of Military and Emergency Medicine at the Uniformed Services University of the Health Sciences, Bethesda, Maryland, and is a member of NCCAM’s Advisory Council. The other is Wayne B. Jonas, M.D., a retired U.S. Army lieutenant colonel who is president of the Samueli Institute, a nonprofit organization in Alexandria, Virginia, with a mission that includes applying academic rigor to research on healing, well-being, and resilience; and translating evidence into action for the U.S. military and large-scale health systems. Pain is not the only issue. According to the JAMA Internal Medicine report, 15 percent of U.S. military post-deployment use opioids, compared to 4 percent of the general public. Drugs such as opioids that are available to manage chronic pain are not consistently effective, have disabling side effects, may exacerbate pain conditions in some patients, and are often misused. According to NIDA, an estimated 52 million people (20 percent of those aged 12 and older) have used prescription drugs for nonmedical reasons at least once in their lifetimes. Read about the researchers and descriptions of the thirteen projects. This work is supported by the following grants: DA038971, AT008347, AT008399, AT008427, AT008336, AT008448, AT008404, AT008422, AT008423, AT008387, AT008349, HX001704, AT008398. For b-roll, other visuals, and to arrange interviews, contact the NCCAM Press Office at 301-496-7790 or nccampress@mail.nih.gov. VA Research has been contributing to improvements in the lives of veterans and all Americans since 1925. The program, part of the nationwide VA health care system, is unique because of its focus on health issues that affect U.S. veterans. To learn more about VA Research, visit http://www.research.va.gov . NCCAM’s mission is to define, through rigorous scientific investigation, the usefulness and safety of complementary and alternative medicine interventions and their roles in improving health and health care. For additional information, call NCCAM’s Clearinghouse toll free at 1-888-644-6226, or visit the NCCAM website at http://nccam.nih.gov. NIDA is a component of the National Institutes of Health, U.S. Department of Health and Human Services. NIDA supports most of the world’s research on the health aspects of drug abuse and addiction. The Institute carries out a large variety of programs to inform policy and improve practice. Fact sheets on the health effects of drugs of abuse and information on NIDA research and other activities can be found on the NIDA home page at http://www.drugabuse.gov.